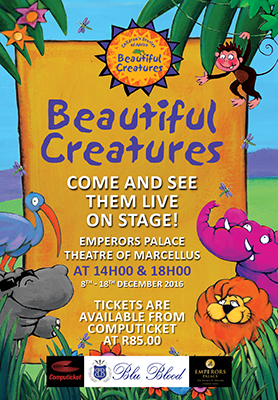 Beautiful Creatures in association with Blu Blood are excited to announce the return of the award-winning children’s stage production, Beautiful Creatures, at the Theatre of Marcellus, Emperors Palace from the 8th to the 18th December 2016. Following on the huge success of their shows in 2010 and 2011, this fun, educational and interactive 60-minute show is back by popular demand and features some of Beautiful Creatures’ most loved characters. The musical tells the story of the shy and quiet Imvubu the Happiest Hippo and how he got to be so happy. We join him on his journey of self-discovery as he befriends Mafutha the Elephant, learns dance steps from Tallulah the Tortoise and finds his “inner roar” with the help of Lucas the Lazy Lion. This popular South African children’s brand was created in 2004 by Alan Glass, Ed Jordan and Paul Choritz. “Using the best session musicians, actors and singers, Beautiful Creatures prides itself on being uniquely South African with a positive global message,” says co-founder, Paul Choritz. The last five years has seen them releasing seven albums which have achieved multi-platinum and gold album sales in South Africa, as well as four children’s books (their fifth book ‘Underwater Zoo’ will be released in 2017) and a series of educational toys. They have also received two SAMA nominations and received the Naledi Award for Best Children’s Production in 2010. “In a world where parents and children have limited quality time, Beautiful Creature’s mission is to bring families together offering a uniquely South African brand with an educational and positive message,” adds Alan Glass. The production is directed by esteemed director and actress, Gina Shmukler. “Beautiful Creatures is a must for the whole family. There is a message in every single song. I think the whole world will fall in love with Beautiful Creatures once they see the stage show,” comments Ed Jordan. Tickets cost R85 and are available through Computicket online (http://online.computicket.com/web/event/beautiful_creatures/1083202143) and various Computicket outlets. Emperors Palace is located at 64 Jones Road, Kempton Park, Johannesburg. For more information, visit www.blublood.com and www.beautifulcreatures.co.za or the BluBloodSA and Beautiful Creatures Facebook pages.